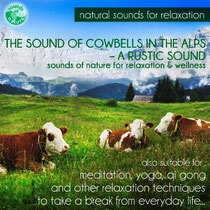 Relax with the sounds of nature – cowbells in the Alps – wellness for the soul. Listen to a unique concert of Bavarian Alpine sounds, feel the gentle breeze of the mountains and enjoy an Alpine vacation without leaving home. 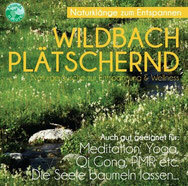 Pure wellness for your ears and your soul! In our technical and over-stimulated world it is very important to give your senses a respite and enjoy a little leisure. 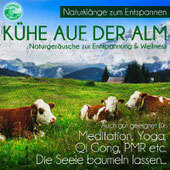 The regular, mellow ringing of the cow bells in this high quality audio-production is suitable for relaxation and meditation. The “Sounds of Nature” label produced by Tunesday Records & Publishing is committed to presenting the sounds of nature for relaxation and wellness in the highest quality available. This recording has been further optimized by an intricate audio-mastering to be more realistic than unmastered recordings. 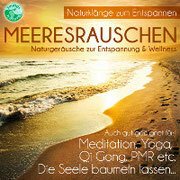 “Sounds of Nature” can be used as background for meditation as well as many different relaxation techniques: Yoga, Qi Gong, PMR (progressive muscle relaxation), Tai Chi, Shiatsu, and in the sauna or spa.